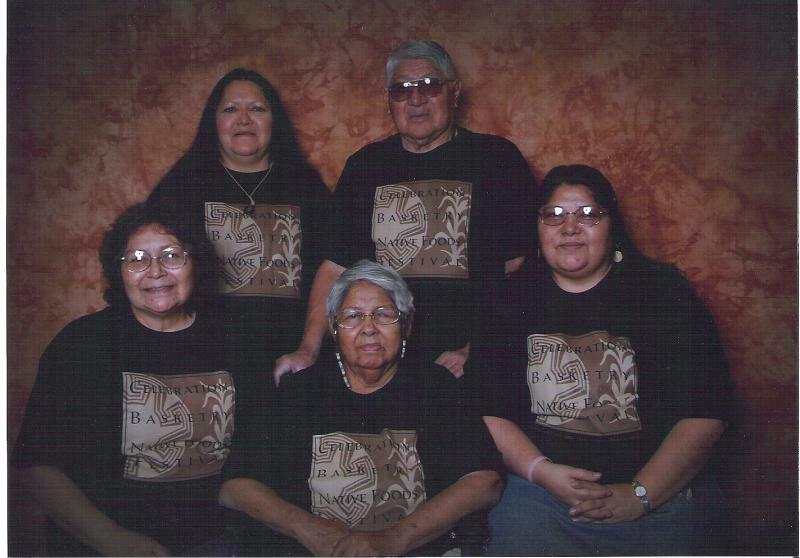 White Knife Shoshone & Co.
Our family has been making traditional and contemporary Western Shoshone cradleboards & crafts for over 50 years. Learning from our mother, Elizabeth Brady, who passed away in 2010, we make cradleboards using our native red willow and red dogwood stems. Our cradles are covered with either hand-tanned buckskin or natural canvas. They vary in heighth from 12" to 40". All of my siblings and I were raised in cradles that our mother made. Most of her grandchildren were also raised in her cradles. 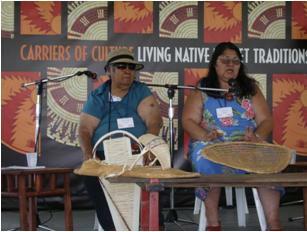 We have also been fortunate to be able to learn from other masters and attend some of the basketweaving events in California, Arizona, Oregon, and Washington. Leah & her mother, Elizabeth were also acknowledged as Master Weavers by the Nevada Arts Council and represented the Great Basin weavers in 2006 at the Smithsonian's Carriers of Culture Folklife Festival on the Mall in Washington DC along with Sue Coleman, Rebecca & Sandra Eagle. 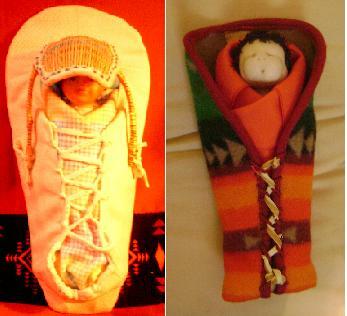 Our sister, Lois Whitney has also participated in the Nevada Arts Council's apprenticeship program learning traditional Western Shoshone songs from our mother and to weave a newborn cradleboard from Leah. In 2014, Lois prepared native bison stew and pan bread for the Smithsonian's Living Earth Festival in Washington DC. Here are a few of the products that we have produced. We make unique native-designed products. Each item takes time and our willow products are seasonal. We gather in late fall, prepare our willow threads by splitting the willow three ways. Each cradle takes more than 100 willows to make the backboard and shade. 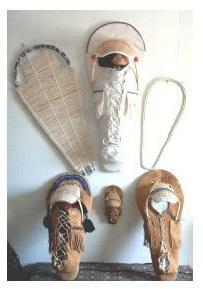 The cradles are then covered with buckskin or natural canvas (not shown). Cost varies depending on size and materials. Infant sized canvas cradles start at $300.00 and up. Buckskin cradles start at $700.00 and up. Different sizes & steps in making the cradles. 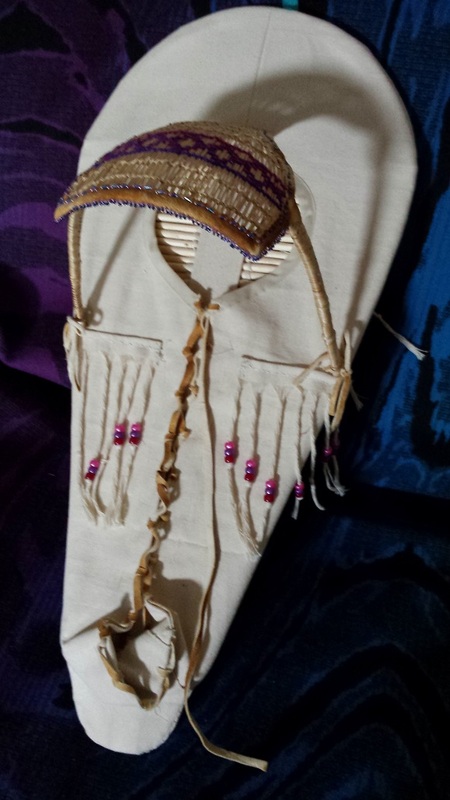 Here is one of Lois's latest doll cradles at 27", it is covered with canvas, willow shade and smoked buckskin straps and bindings ($250.00). She also has 17" and 13" cradles at $150 and $140 cost. Doll cradles are made the same as our large infant cradles from willow and red dogwood. Even the little cradles have over 150 scraped willows on it. Doll cradles (from $75.00 and up) and soft sculpture dolls ($40.00) by L. Whitney. 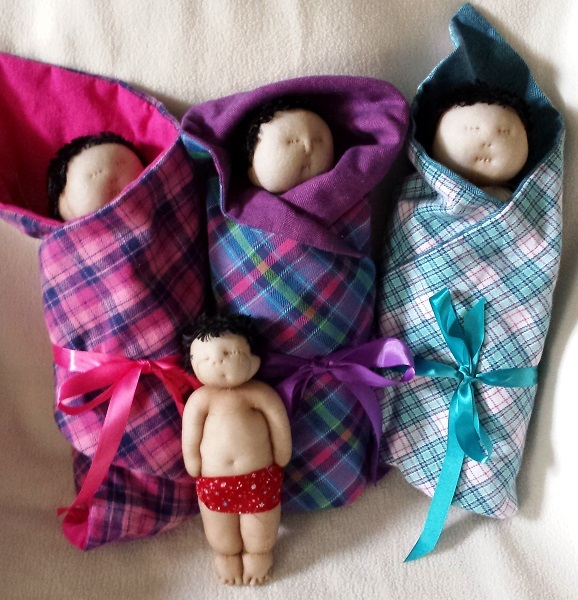 Contact Lois at 775-340-9897 if you are interested in our cradles or dolls. Copyright 2011 White Knife Shoshone & Co.. All rights reserved.